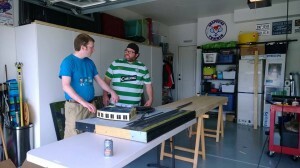 A few members of the SIG met to build the new Station Module at Juha’s house on a recent Saturday. Accomplishments of the day were the construction of the new longer station module (wood work) and we also started placing the round house, which was build by Max onto the layout. That started with a valuable lesson to read the instructions before applying power to something (we mixed up AC and DC and blew the LEDs, which are located in the round house). 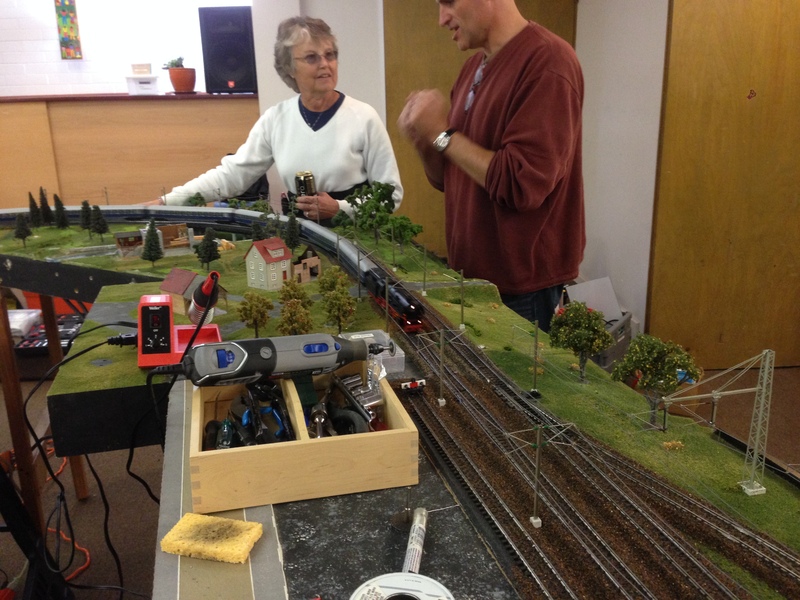 Philip, Juha and Max will present the new shunting yard idea to the larger SIG membership at the next meeting on March 8th. 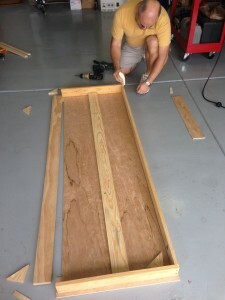 Our general idea is that the left side station module (wood work courtesy of Pete) will house the round house and turn table. We were thinking of adding some shunting tracks and maybe a diesel or coal re-fueling station. The long module portion (right side), will house to its left side a small freight terminal and 2/3 of the right side will house the passenger operations. The module will have again 4 tracks (where as the two middle ones are the main tracks). 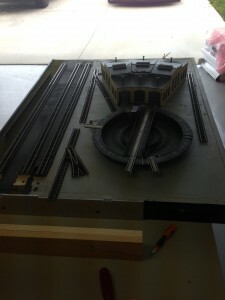 The outer one towards the shunting yard / terminal will be connected in a separate power circuit to the old Digital system the club owns. This way we can have some yard action and have the long trains running on the main track at the same time. The idea is to sell the shunting yard / turn table area as a Museum to the public. This is a very typical application, since actually train restoration clubs in Germany (and I have seen it in Switzerland as well) purchase old round houses from the federal train companies to restore old steamers or diesel locomotives, such as the V200 class trains. These clubs are periodically presenting their treasures to the public during festivals. Therefore, it is legit to run the ICE or Thalys on the main track and have old style locomotives on the shunting yard or even new style locomotives, which have been moved there to push “defective” locos around. 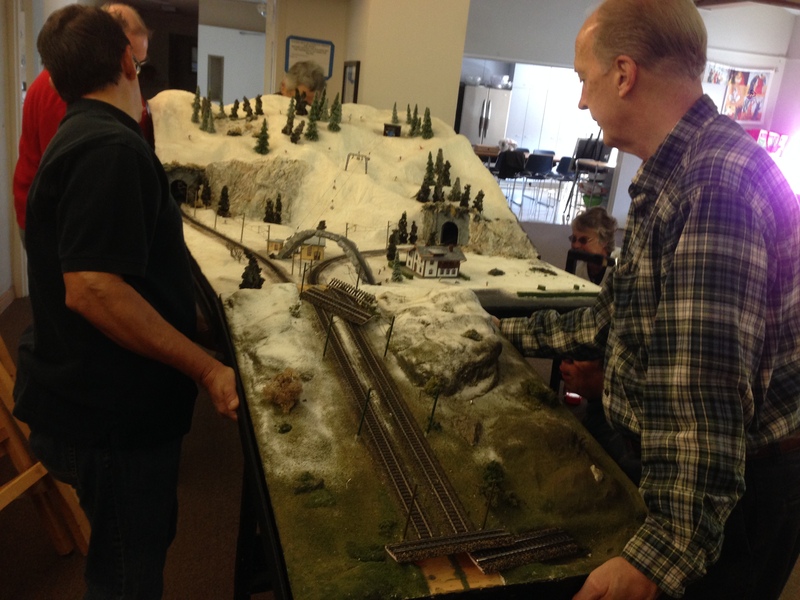 The SIG met at Bethlehem Lutheran church to perform repairs to the SIG layout, especially on the Signal electronics, to discuss the new head amusement park ride module under Cindy’s care and also the group around Juha started working on the new train station module by taking the old apart. The train station module is planned to have a compact shunting yard with a Marklin turntable (if we find an affordable unit) and round house (either Marklin or Faller) in addition to the buildings for passenger operations. Instead of the currently three modules, in the future, it will have two long modules. It was also discussed that modules should have a uniform green coat. SIG members were encouraged to adopt a module for refurbishment. AND of course, we had some good looking trains running while discussing next action items. The next SIG workshop meeting is on March 8th, however, there will be workshop sessions for the amusement park and the train station in between.